The legendary Amalfi Coast is a special place. As a visitor armed with a guidebook and recommendations from friends you can explore the usual sites; but on the Amalfi Coast experiencing local culture firsthand requires a native touch. 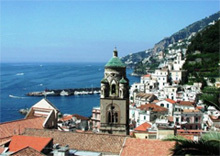 We at Amalfi Life are experts in the culture and cuisine of the Amalfi Coast. In sharing our intimate knowledge of the region we love, you will experience a trip that is uniquely special. If you are skeptical about joining a small-group tour, you'll find that our highly personalized approach, limited enrollment, and unparalleled access to the local life make an Amalfi Life small-group tour a great way to travel. "[Your tour] has set a new standard for all of our family holidays in the future. Everything you organized worked just perfectly, and at each stage our whole party kept commenting how wonderful it all was. Every day was different and a new experience." "Laurie, the trip was fabulous! - plenty to see and do, but not to get 'frantic'. We loved everything !" Stunning trails, food, wine, and fun. An Exploration of 2,000 years of history. A new itinerary is in the planning stages for 2017.